As with most things, the best treatment for high altitude sickness is prevention. For the majority of travelers, life threatening consequences of high altitude sickness are avoidable if ascent is slow, the body is given time to acclimate, descent is initiated early and continues until symptoms abate. According to studies of deaths related to high altitude sickness, most deaths occur in travelers who are part of organized group treks to high-altitude locations. People may be reluctant to admit that they are having difficulties because of perceived group pressure or a reluctance to force a change in itinerary, but it is critically important that people seek help. The treatment of choice is to descend to a lower altitude or, if the symptoms are mild, at least to stay at the same altitude until the symptoms subside. In addition to acclimation and descent there are medications and treatments that can be used to prevent or treat symptoms at a mountain camp or on the trail. Prevent or treat AMS. The most common preventative medication. May cause severe allergic reaction, especially if person is allergic to sulfa drugs. Acidifies the blood and increases respiration. Useful for treating periodic breathing and sleep apnea. People may experience parasthesias in fingers and toes. Treat AMS and HACE (prior to onset of coma) while trying to descend. This may make people feel better but not improve acclimatization so it should be used with caution. Effectively lowers pulmonary artery pressure. Tadalafil HAPE prevention PO 10 mg twice a day Lowers pulmonary artery pressure. Beta-adrenergic agonists up-regulate the clearance of alveolar fluid and attenuate pulmonary edema in animal models. Treat HAPE, but can lead to collapse if person is dehydrated. Medications are the most important treatment for AMS. Several portable hyperbaric chambers are now available for treatment of severe forms of altitude sickness. They are all fairly similar in that they are lightweight, air-impermeable bags that enclose the person and are inflated to a pressure that is significantly higher than the ambient atmosphere. The portable hyperbaric chamber (Gamow®, Certec®, PAC®) is often simply referred to as the Gamow bag, named after its inventor, Dr. Igor Gamow. It is now widely used among adventure travel tours, trekking groups, and mountain climbing expeditions. These portable chambers have saved many lives. A person who is experiencing symptoms of high-altitude sickness is sealed inside the portable hyperbaric chamber, and the air pressure is increased around the person, simulating descent of as much as 7000 feet. The bag is constructed of nylon with a zippered opening to allow the person to crawl inside (or be placed inside). The bag is then sealed and inflated. There are 4 small clear windows to allow visual contact. The bag is pressurized with ambient air to 2 pounds per square inch by means of a foot pump. The portable chamber folds up into a backpack weighing less than 15 pounds so that it can be carried on high altitude treks. People are usually treated in 1-hour increments and then re-evaluated. Some bags have CO2 scrubber systems, but if it’s not present, someone needs to continue pumping several times per minute to flush fresh air through the system, and that can be tiring. After the first hour, additional hours of cycles of artificial descent may be needed until the person has improved enough that no further treatments are necessary or the person is able to descend to a lower level. Relief usually occurs within minutes, but there may be rebound effects if treatments are too short. It’s important to compress and decompress the bag slowly, while talking to the person inside as that person may be very stressed and frightened. If a small oxygen tank is available, it can be placed inside of the hyperbaric bag so that the person can receive oxygen (4-6 l/min) during treatment. Persons suffering from HAPE may need to have the head of the bag elevated 12-16 minutes, at least initially. 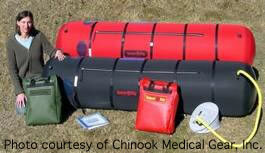 If the weather is cold, a sleeping bag should be inside of the hyperbaric bag. If the treatment is being conducted outside in the sun, the bag should be shaded to avoid overheating the person inside. Several portable hyperbaric chambers are available to treat high altitude sickness.